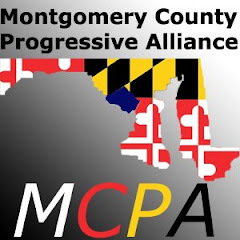 Montgomery County Progressive Alliance: Maryland PDA Events Coming Up! Please join us at some or all of these events this month, and join us in welcoming Progressive Democrats of Towson, our newest chapter, to PDA! 2. PDA chapter meeting in Wheaton (Weds. 1/7)--contact me to organize one near you! First Meeting: Tuesday January 6th, 7:15 p.m. Confirmed: District 18: Senator Richard Madaleno; Delegates Al Carr, Ana Sol Gutierrez, and Jeff Waldstreicher; District 19 Delegate Roger Manno; District 20: Senator Jamie Raskin; Delegates Sheila Hixson, Tom Hucker and Heather Mizeur. Co-sponsored by the Progressive Working Group, Progressive Neighbors, and Eastern Village Cohousing Community. Second Meeting: Sunday January 11th, 1:30 p.m. Among the legislative priorities that will be presented to legislators at the meetings: the Global Warming Solutions Act, combined taxation reporting for corporations, protection for immigrants, public financing of General Assembly campaigns, Workforce Anti-Fraud Bill, protection for tenants, defunding the ICC, Health Security Act (single payer), bill on electoral integrity and transparency, protection for students from military recruiters, Civil Marriage Protection Act, gender identity and expression protection, no police spying on lawful activities, and bring the MD National Guard home. PDA is a founding member of the Progressive Working Group--a coalition of progressive groups working to create a united progressive presence in Annapolis. Plans for 2009 including support for leafleting, PDA upcoming events, more. The Elections are over, we did great, now we have to make plans for efforts into 2009 and beyond including the PDA national grassroots conference January 17 and 18. 3. Eco-Justice Cafe' in D.C. family-friendly fun. Featuring music, poetry, an open mike session, good food, good beer, good people, good cheer, good info and good karma! University of DC, Firebird Inn, Van Ness/UDC Red Line West exit--Building 39, B-Level, 4200 Connecticut Ave., NW, 20008. 4. Help Leaflet January 16 PDA and the Leadership Conference for Guaranteed Healthcare/National Single Payer Coalition will leaflet at metro stations all around Washington, D.C. to tell people about healthcare reform and PDA's Healthcare NOT Warfare campaign. From 5 p.m. until we run out of leaflets or crowds. Red line: Shady Grove, Medical Center, Silver Spring and Takoma Park. Green line: College Park, Greenbelt and Branch Avenue. Orange line: New Carrollton and Largo Town Center. Contact Dr. Margaret Flowers at conversationcoalition@gmail.com to sign up. 5. PDA National Grassroots Conference in D.C. January 17-18 Join several members of Congress, progressive leaders, Col. Ann Wright (ret. ), workshops, panels, live music, celebration, tabling, MORE! 6. Support Progressive Legislators, The 90-Day Maryland state session begins January 14. Please support progressive legislators before the session. No contributions are allowed during the session. PDA Martin Luther King Day Pre-Inaugural Tribute fundraiser: Intimate conversation with PDA Advisory Board Members and friends including Rep. Raul Grijalva, Co-Chair, Progressive Caucus; Rep. Jim McGovern; Thom Hartmann, award winning radio host/best selling author; Tom Hayden, peace activist; Donna Smith of Michael Moore's SiCKO; Code Pink founders Jodie Evans and Medea Benjamin; John Nichols, The Nation Magazine, author The Genius of Impeachment; live music by Dan Reed; SURPRISES! Please contact me for an invitation to the event, January 19 from 10 PM to Midnight. Regular price $300 but available for $275 for a limited time. A Progressive Agenda for the Obama Years: Pre-Order PDA's 5 DVD set recorded live in Denver featuring exciting guests (House Majority Leader Steny Hoyer, Sen. Jamie Raskin, Rep. Lynn Woolsey, Rep. John Conyers, Rep. Barbara Lee, Rep. Raul Grijalva, Rep. Dennis Kucinich, Rep. Robert Wexler, Rep. Keith Ellison, Rep. Jim McGovern, Rev. Jesse Jackson, Jim Hightower, Amy Goodman, Ron Kovac, John Nichols, Norman Solomon, Donna Smith, Vincent Bugliosi, Mimi Kennedy, Tom Hayden, Jim Zogby, Greg Palast, MORE! ), panels, live music. $45 for a limited time. Order online here. Keep PDA working for you, we're organizing events, supporting legislation, backing candidates, and reaching out to the public on your issues. Support PDA through the Change Makes Change program or with a one-time contribution. Progressive Democrats of America is a grassroots PAC that works both inside the Democratic Party and outside in movements for peace and justice. Our goal: work with and increase the progressive majority in Congress as we build on our 2008 electoral successes into 2009 and beyond. PDA's advisory board includes seven members of Congress and activist leaders such as Tom Hayden, Medea Benjamin, Thom Hartmann, Jim Hightower, and Rev. Lennox Yearwood.